Russian river cruises, which have been popular mainly among older couples, are rebranding to attract a younger audience. Cities along riverways can both aid in this process and benefit from it. In the small Russian city of Myshkin, there is the Mousetrap Restaurant. Sometimes, playing on the well-known saying “the only free cheese is in a mousetrap,” the café serves free cheese. Myshkin is one of the many cities that can be visited by taking a steamboat cruise along Russia's longest river, the Volga; it is also one of the most striking examples of how Russian river cruises in recent years have begun to transform themselves from a lazy holiday for seniors into an attractive type of tourism that provides entertainment for any age. It was probably easier for Myshkin to develop and begin to capitalize on its city brand than many other ports of call. The city, named in honor of a mouse that ran across the face of an ancient Russian prince, thereby waking him up and saving him from a deadly snakebite, is literally saturated in the mouse theme. Magnets with mice hanging from gallows, for example, have enjoyed great popularity with tourists – a visualization of the fable of how a mouse is supposedly hanged in an empty refrigerator. Upon docking in Myshkin, the steamship is greeted by life-sized puppets of a mouse-lord and a mouse-peasant; in a special Mouse House the mouse king and his queen hold an audience for guests. If visitors tire of mouse-related entertainment, the town also is home to a museum that features old cars, bikes, sleds and launches. According to Anatoly Kuritsyn, head of the Myshkin Municipal District, out of the town's population of 6,000 people, the tourism industry employs 700 – as many as work in the city’s main oil refinery. The residents of Myshkin justifiably feel that they understand how to create a popular tourist destination: in 2011 alone the city was visited by 160,000 tourists – almost 27 guests for each resident. For those who are more accustomed to setting their own agenda on vacation, the first day on a steamboat may seem like torture, a kind of floating prison from which there is no escape. But fellow travelers provide an excellent diversion. After some time on deck, strangers magically transform into interesting conversation partners, players in tabletop games and researchers of riverside cities. 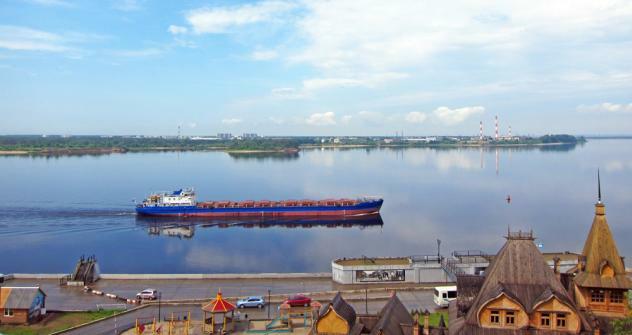 Cruises on the Volga continue from June to September. Different cruise lines offer different length itineraries: from two days to three weeks. A 10-day cruise costs between 25,000 to 50,000 rubles ($800-$1,600), depending on cabin class (including all meals, drinks are paid for separately). Popular starting points for itineraries include Moscow, St. Petersburg, Samara and Yaroslavl. "People who go on river cruises are more often than not those who have already been on such a cruise or those who have been recommended to try it by friends," said Sergei, a tourist company representative. The influx of fresh blood is extremely low, and Sergei attributes this to stereotypes that are fixed in people's minds: a recumbent holiday spent on the deck, spa food served three times a day, and boring retro songs issuing from every crevice 24 hours a day. In part, all of these things are still there on modern steamships; however, many in the river tour market are trying to diversify the range of their services, and the good example of Myshkin is contagious. For example, the city administrations along the route are themselves interested in introducing river tourists to their cities in such a way that they want return again by car, train or bus tour. The main lures, of course, are cultural heritage and handicrafts. A short distance from the metropolis of Nizhny Novgorod, the city of Gorodets is building an entire folk craft quarter, where it is possible not only to see the works of artists working in traditional mediums ranging from woodcarving to weaving, but to decorate a plate in the trademark Gorodets style or to mold a cockerel whistle out of clay. "You get an excellent result, it only takes a little tinkering," said Alla, the supervisor of the Gorodets artists, as she fluttered over a group of tourists. In a minute, she spins the hapless tourist's crooked clay lump, and as a result presents him with a figure that already completely resembles the intended bird. "We had no idea how diverse your country is," said Lynn, 52, from Australia, standing by the house-museum of the Russian artist Isaak Levitan in the tiny town of Ples (2,500 inhabitants). "A river cruise on the Volga – that's what we were advised to do after visiting Moscow and St. Petersburg," added her husband, Robert, 54. They vied with each other providing enthusiastic reports about their journey, indicating that the new tactics of the tourism companies were already finding some success.